Just a quick and easy glitter mani with stamping today. I used Dollar Nail Art's celestial loose glitter set as my base, then stamped with Born Pretty Store's white stamping polish and MoYou London's Hipster plate 08. The images turned out so crisp and clean, and the polish is ridiculously pigmented! It has a strong smell, but works perfectly even over dark colors! 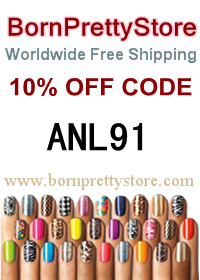 If you shop Born Pretty, use my code ANL91 for a discount!